I can’t and don’t read and play. On occasion I will pull the sheet music up to get a grasp on where a song is at > The key, some of the notes, etc. So does the key signature imply that it sort of is in the key of G? Please look at all the notes on the C space of the staff. They are all accidental sharps. Someone could put a sharp at C in the key signature and remove all those accidental sharp symbols, making the key signature that of D major. Keep in mind that whoever wrote the score may lack understanding of such things, or may have been careless about it. Do the notes of the chords stay in the D scale? If not, do they seem to agree with the accidentals in the measures where they are used? I think you may get confused if you expect a usual chord progression in this piece, relative to D. Most notably, it doesn't end on D. There are ways to adjust your thinking to that, ha ha. To give you a hint, I think it's going to be best to think of the piece as being neither major nor minor. BTW, I played the melody as written, on violin, and I found four notes that didn't seem to agree with my memory of the tune. @StoneDog: Songs aren't always written from a scale, or at least they may not entirely be from one scale. It is not that unusual to take notes from the chords played to use in the melody. If the songwriter/composer chose not to adhere strictly to the "vanilla" chords from the simpler triads available from the diatonic scale, it can result in notes that don't fit in a strict diatonic scale. Also the Key Signature only shows what the song has been notated in. It does not necessarily actually show the Key that the notes or chords used in the song come from. You can take any set of notes, say CCGGAAG, and decide to notate them on a staff with a key signature of anything you want, maybe Eb, and use accidentals to get whoever has to read it to actually play the pitches you want. It is still technically correct. So the key signature is not always a reliable indicator of what scales or chords or notes to expect. 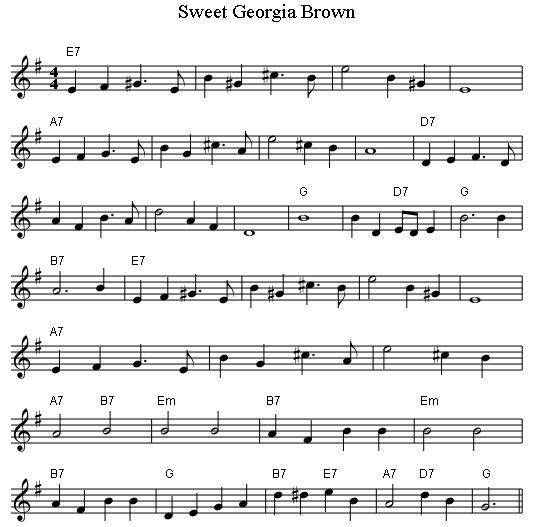 Not quite sure why the person who did this version of Sweet Georgia Brown decided on the key of G. Maybe they felt the presence of a G chord and/or an Em chord somewhere in it justified that key signature, or maybe they just like the key of G best for some reason. No telling by just looking at the score, we can only guess. I was also thinking that perhaps it should be in the key of D.
I also thought the same way, the composer could have taken out all the accidental sharps off of C and make it into D major, or he/she could have taken out all the accidental sharps off of C and G but add G natural for the last few measures and make it into A major. What key is this ? If anyone wants to hear what this piece sounds like without actually playing it, ha ha, they can go to http://abcnotation.com/tunePag.....g.txt/0062 and copy the ABC notation, then paste it into a file on their own computer. Then they would open MuseScore and its Plugin menu and its ABC import feature to read in that ABC file. Musescore will then produce a score that can be played back and/or edited. In the melody, there are a couple G's that I think I would change to G#'s and three A's that I would change to B's. @pky Yes, I saw that about writing it in A too. That would actually leave it with the fewest accidentals. The worst part about that I think is that it would put the G chords and, most importantly, the last note of the piece out of scale. If the piece is scored with a key signature of D, the tonic being G would imply Lydian mode. I think we should consider whether maybe the score is a mess, ha ha. I happen to know that we have a certain Sweet Georgia Brown expert as a member here, and I think he might be able to give some ideas about that. I figured some information about the chords, using the chord finder at http://chordfind.com/ . I'm not sure of the implications, so, if you have some analysis, please contribute it. I think we are going to agree that the tonic is G.
I compared some of the facts seemingly related to the choice between key signatures G and D.
Note that the piece does not contain a D-major chord. For each chord, I asked whether it fit perfectly in the candidate key signatures, that is, whether all the notes of the chord are in the key signatures. E7,G,and Em fit both G and D.
D7, having a C, which is out of the D scale, fits G alone. A7, having a C#, fits D alone. B7 would fit both except that it contains a D#, which fits neither. There is one D# in the melody. D7 is the dominant seventh chord (V7) if the key signature is G, and D7 is followed immediately by G (the tonic) in all three places that D7 occurs. G is preceded only once by anything other than D7, namely B7. I'm thinking that the repeated V7/tonic sequence and the absence of the D-major chord are the strongest indications that the scale should be considered to be G-major rather than any mode of D, this despite that two sharps reduces the number of accidentals needed. After this analysis, I am less inclined to say that the score is a mess. But I do think that some notes in the melody don't follow the way the tune is usually played. Edit: 12:50 pm ET Sep 20: Notice also that the piece doesn't have much of any non-major sound to it. Thanks guys for your response on this. What I like about this tune is how once it gets going it allows a lot of room for improvisation. From reading all the post I at least don’t feel as if I am totally missing what should be obvious. SOoo, I will wing it. Thanks again!!! You all ROCK!!!! I was doing the same kind of analysis in my head but gave up after a while. Figured that it was too correct to call it a mistake but felt like the necessity of adding an extra accidental would have been worth calling it the key of D.
In any case, great call. 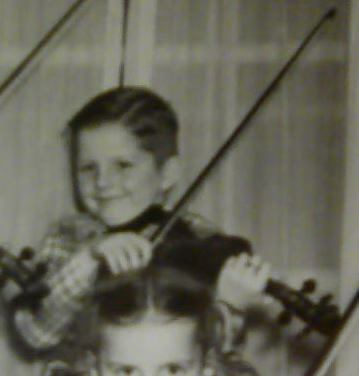 @Fiddlestix: Sounds like the key of F major to me, Ken. You can hear full resolution of the melodic phrase on F when the guitar goes to the F major chord. @Fiddlerman Thank you, FM. It's very gratifying to get such a compliment from you. @DanielB Same kind of thanks to you, and the same feeling. I just learned the importance of the dominant seventh cord a couple days ago, watching a youtube lecture video on the sonata form, where it was stated that V7 is always or usually invoked near the end of the development section of a sonata. And luckily I was chatting in the company of a new member who informed me that V7 cries out for a return to the tonic, implying that the recapitulation and its return to the home key will be all the more satisfying to the listener. Now would anyone be surprised to know that that member is also our Sweet Georgia Brown expert, having played it on about five instruments---sometimes, I believe, in paid performances in some pretty large venues? I would be very happy to get some more analysis of this piece, agreeing or disagreeing, especially about the notes of the chords that don't quite "fit". Interesting DanielB that you are pointing at F > When I first started fiddling around with this tune I said to myself it feels like its in F > To check myself I looked up the sheets on it and the confusion began prompting me to post my question. It would be SWEET if the new member you reference RosinedUp does key in on this. I would be interested in what said member would post. @StoneDog: Just to clarify a point, the sheet music you posted is not in the same key as the video that Fiddlestix asked about. Any song can be done in any key really. But F would be a pretty easy one if you want to tackle this song on violin playing by ear. Try starting it (main melody, not counting any intro) on the open D.
Stonedog's version is in the relative minor key of E minor. Count down 3 semitones to find the relative minor from the major key. G major = E minor. Who is the "Sweet Georgia Brown" expert RU? I haven't figured that one out. I expect he'll show up here soon. If not, I'll goad him a little. But be prepared. I expect his analysis to go beyond pitch analysis into rhythm and aesthetics and to also be earnest, subjective, and devastating, ha ha, but also in an important sense objective. Stonedog's version is in the relative minor key of E minor. To be brief, that's probably not the best way to think of this piece. Notice that both the melody and the harmony end up on G. Also notice that the tune doesn't have much of a sad sound. G major = E minor. True in the sense that those two scales each can easily be written using the same key signature: one sharp. Also true in that a tune in E-minor and a tune in G-major are both best written with a key sig of one sharp. I love to see someone starting to understand key signatures and scales. Our SGB expert informs me that he never performed SGB in a paid performance (sorry for my wrong guess), also that he is for now busy analyzing the first movement of Mozart's Symphony No. 40 in G-minor, regarding its sonata form, and may not make it to this thread right away. BTW, I'm studying that with him, and you could probably join us if you want. He happens to be quite a harmonica player, to understate it by about a mile, and a popular fellow over on the chat, where you might easily bump into him. His name here is @iowaplayer .